Too bad I didn't place a bet yesterday on the Grey Cup! Our team in British Columbia, the Lions, won 34-23 in front of 54, 313 fans at BC Place Stadium. An amazing turnaround as they started the season 0-5! Let this be an inspiring message for the Buffalo Bills, who have dropped four straight now to sit at 5 wins and 6 losses. The Jets (not Winnipeg's) beat us yesterday, 28-24. Here is another prediction for you: the BC Lions will win the Grey Cup again in 2012! 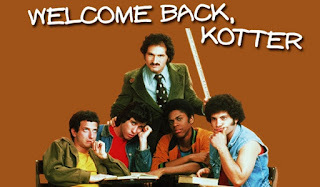 Nice Movember moustache there Gabe Kaplan! Flashback to the late '70's and a young John Travolta in red. Four points for Sidney Crosby yesterday! That concussion cannot keep him from competing anymore! St. Louis will play Pittsburgh tomorrow and then Ottawa visits the Consol Energy Center on Friday. Buffalo doesn't have to worry about Sid the Kid until December 17. Whew! Best Deal Ever at McDonald's? That's what my script said yesterday for another Buffalo Sabres' sponsor read. I thought about going to McDonald's for my lunchtime coffee BUT I opted for my usual Tim Hortons. 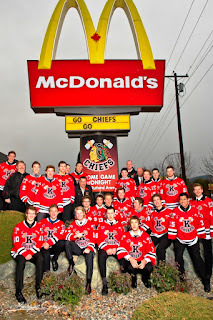 Nice to have McDonald's on board though as a sponsor again with the Kelowna Chiefs. Building Stronger Community is the motto for this season. 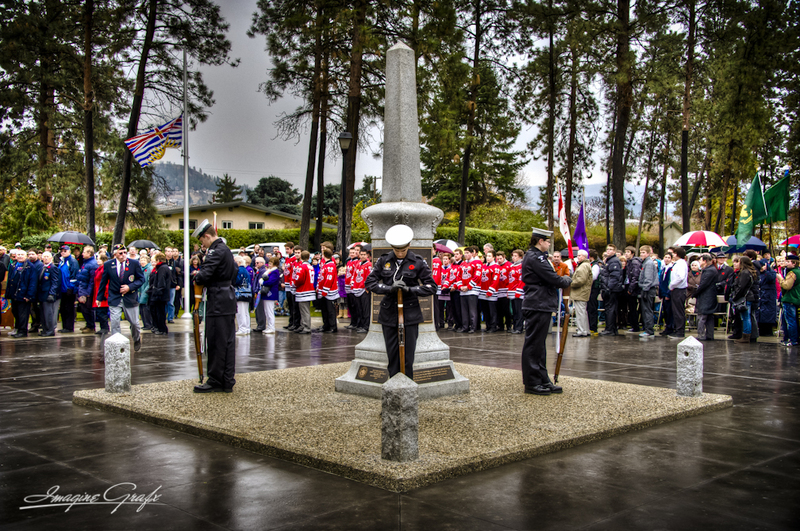 ceremony at the Rutland cenotaph. Kelowna is home to some retired CFL football players. That was the front page story last Friday by Warren Henderson of the Capital News. Here is the link. On Saturday morning I had a great breakfast with NFL artist, Bob Mueller. He gave me several prints - including Deion Sanders as a Dallas Cowboy (the Buffalo Bills' next opponent) and Jim Brown, who many consider the greatest running back in NFL history. Deion made the Hall of Fame this summer and I love how he opened his speech! Bob is a great speaker too! Check out the link to an interview in late September on my blog. 2:47 in here has the 23-0 shutout against Washington in Toronto from October 30. 3:00 in has the exciting 27-24 loss to the New York Giants on October 16. 2:56 in has the Bills' 31-24 thriller over Philly October 9. 23-20 loss in Cincinnati October 2. Game recap 3:02 in. Best for last! 34-31 over New England September 25. 3:20 in for my segment. Crazy Sunday statistic from the NFL: Patriots receiver Wes Welker had 9 receptions for 136 yards. Compare that to Chad Ochocinco, who has 9 catches for 136 yards ALL season. Ouch! Last month, we had the chance to take in the movie "Courageous." Honor Begins At Home is what the tagline should read below. Sitting behind us at the Kelowna movie theatre was the stunt coordinator on the film, Jimmy Broyden. It was great to meet him. Jimmy has an awesome resume! Please download the song from iTunes or cdbaby.com. It's only 99 cents and you will be helping a great cause. Feel free to share this with your friends! Talent Runs (and Carves) in the Family! Congrats to the Cardinals for winning the World Series! Congrats to the Carvers of these pumpkins! A word of wisdom from my sister-in-law, Tina. 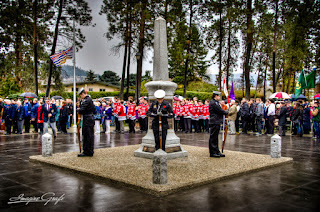 Johnny Canuck from my nephew, Ben, in Prince George. This is for Canuck fans everywhere! Heading into last night's 4-2 win against Columbus, the Sabres had scored 23 goals - matching 23 touchdowns by the Bills. The most famous #23 in sports right now is David Freese of the St. Louis Cardinals. He won game six last night in the eleventh after tying it up two innings earlier! David slay the giant in the Bible and Jesus was the son of a lowly carpenter. David Freese was in the spotlight last night and I figure the Cardinals have a great shot at winning game seven tonight against the Texas Rangers with Chris Carpenter on the mound. Prefer My Microphone over Microscope! People can be so passionate about their sports teams. Hockey's Flyers had ten more points than the Sabres last season but I predict Buffalo will rack up more this season. Philadelphia plays Boston on opening night Thursday while the other Pennsylvania team, Pittsburgh, is in Vancouver. The Sabres get their season going on Friday against Anaheim and Teemu Selanne in Finland. One of our big free agent signings is from Finland - and a former Philly Flyer, Ville Leino. Happy Birthday (#28) this Thursday to Ville! Deliver 28 goals this season and Sabres' fans will love 'ya! Mike Modano called it a career today. He is 22nd all-time in NHL points and leaves as the highest scoring American NHL player ever, achieving that mark early in the 2007-08 season. Modano signed a symbolic contract with Dallas yesterday to retire with the franchise he helped put on the map. Thanks for the memories Mike! Steve Sabol of NFL Films helped make it happen for Bob Mueller. The NFL just tweeted about an hour ago: On the first official day of Fall, Steve Sabol remembers how he composed "The Autumn Wind." Enjoy! It's all about John Madden and the Oakland Raiders "back in the day." Bob Mueller just left a comment too. Catch-22 is easier said than done. 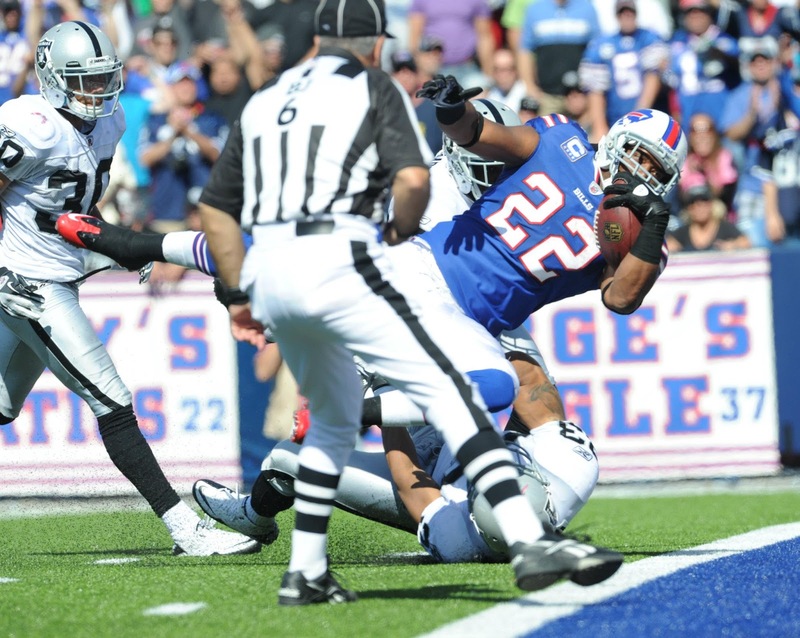 Fred Jackson is number 22 on the Buffalo Bills and he ran for 117 yards yesterday as the Bills stormed back to beat the Oakland Raiders, 38-35, at Ralph Wilson Stadium. We were down 21-3 at the half. 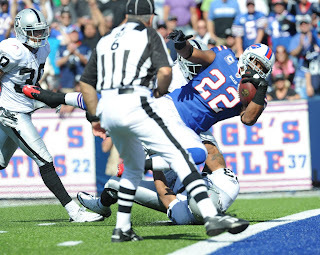 Fred Jackson is now #1 on the rushing list with 229 yards while Oakland's Darren McFadden is #2 with 222. On September 22 this week, my blog turns five! On the same day, the WHL launches into another hockey season on Shaw-TV with the Brandon Wheat Kings at Moose Jaw's new arena, Mosaic Place. There will be 32 regular season games broadcast this season and this is my fifth season voicing the promos. As the NFL prepared to remember 9/11 on the first Sunday of the year, Steve Mariucci shared his memories of the 2001 season. 1:13 seconds in. Canadian Stephen Brunt commemorated the 10th anniversary of 9/11 with this video essay, "A Decade Later." Hear him 1:37 seconds in if you would rather bypass the footage. By the way, Stephen Brunt has written bestselling hockey books, "Searching for Bobby Orr", and "Gretzky's Tears." 3:33 in (unless you count my station ID at the start): My segment (Offseason Recap) for the Buffalo Bills' "Thurman Thomas Show" this weekend. Can you believe the Bills had the biggest blowout on the NFL's opening Sunday? Wow! 41-7 over Kansas City! My exhibition season recap for the Buffalo Bills runs this weekend on the "Thurman Thomas Show." I'll post the segment (voiced yesterday) in a couple of days. There’s still something about VO that has intrinsically changed my approach to RELATIONSHIPS & COMMUNITY. 1) I can’t do it alone…or at least that I do it much better with help. 2) My life is richer in association with others. 3) When I give unselfishly, I get that and more in return. 4) Others have similar struggles as I. 5) Together, we’re smarter, stronger, faster. 6) Being an island is lonely. It had three lessons. Briefly, be choosy with your marketing; Keep an eye on events, and when you find one that might fit your philosophy and style, act fast; and replace money with creativity. In other words, build your word-of-mouth marketing from the bottom UP and let your work speak for itself! 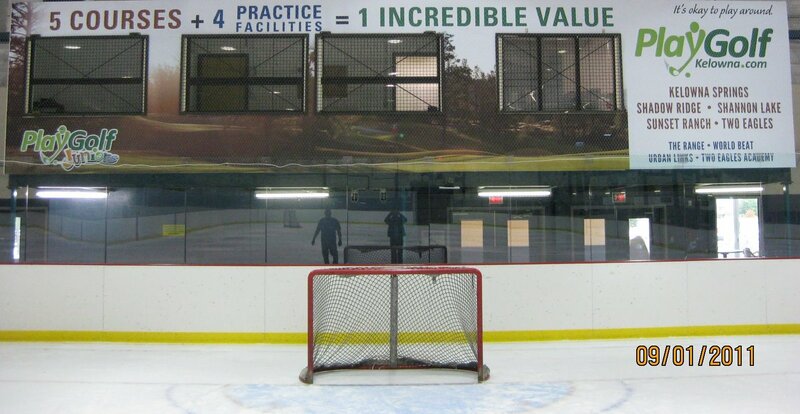 Hockey fits the bill in those areas for me. I voiced my first promo commercial Thursday for the WHL on Shaw TV. This is season five doing that. It came about after my first season in 2006 of voicing MSG-TV openings for the Buffalo Sabres. The Brandon Wheat Kings will be in Moose Jaw September 22 as the new arena, Mosaic Place, opens up in MJ. Former NHL coach, Cory Clouston, will be behind the bench for Brandon. Cory Bell-Esau, in the press box at Rutland Arena. You'll hear me as the public address announcer tonight. 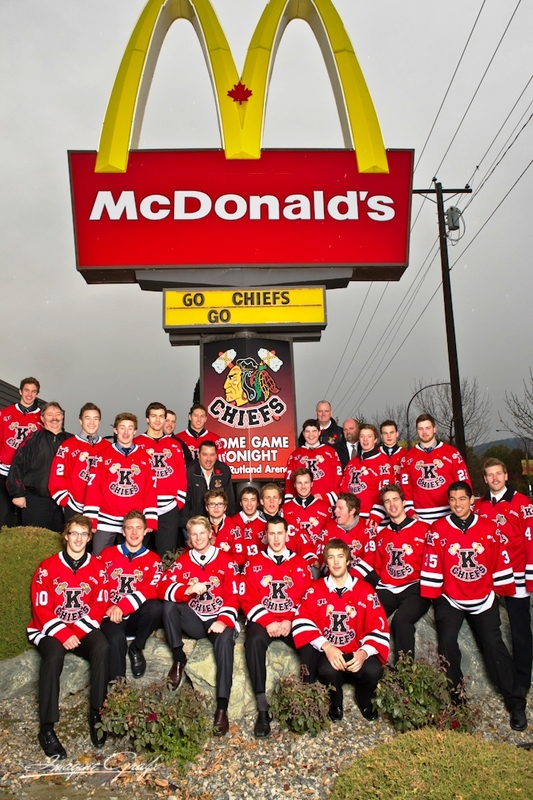 We are glad to be back for the Kelowna Chiefs' second season in the KIJHL. It is an exhibition game against the North Okanagan Knights. Our regular season home opener is September 17 against the Spokane Braves. Saturday's headline in our local paper was about the pressure Kelowna's Danny Watkins is under in Philadelphia, where he is protecting quarterback Michael Vick, who just signed a six-year, $100 million contract today. I like the deadline pressures associated with voiceover work. I prefer that over a physical beating on the football field:-) The start of my week sees me halfway through a 12-page prototype module for NAPA Auto Parts. Once this gets approval, we will have fifteen modules to complete by next spring. This is in addition to eight longer training modules this year for another division at NAPA. I hope to wrap this prototype up tomorrow and then begin voicing a 169-slide bank handbook due for another client after the long weekend. Friday Facebook FUN! Kids Are Cute! HEY! HST tax out in BC today! 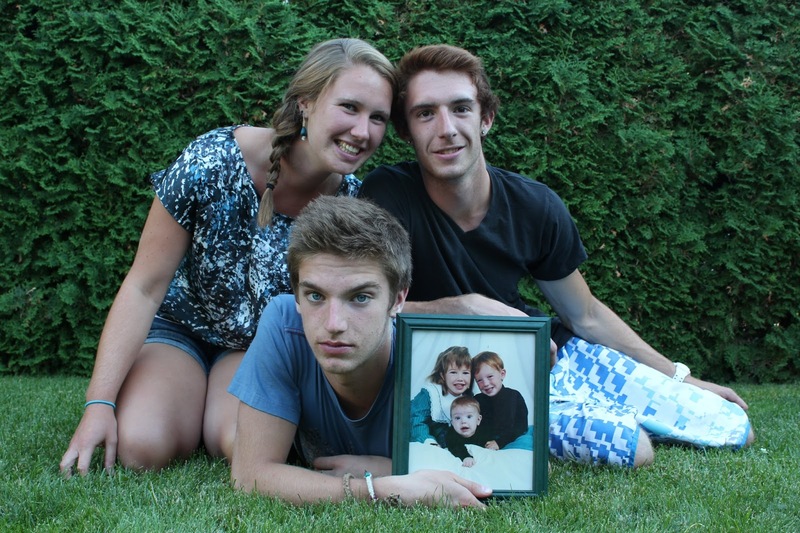 My kids recreating a pose from their early days: Ashley, Justin & Jordan Hass. Great idea and photo by my niece, Nicole! Wednesday afternoon Facebook status: Happy Birthday to my wife of 23 years on August 24th - Darlene rocks! Monday's video link: Not only do players start at a young age, so do hockey announcers! Baseball has been making regular appearances on my blog lately. Yes, Ralph Hass has been blogging baseball! Thursday, Rabbi Hess blogged baseball on Ralph Branca and his faith journey. He was the pitcher who gave up the Bobby Thomson homerun in 1951 dubbed "the shot heard 'round the world" that won the pennant for the New York Giants. Barrin Simpson plays solid defense for the Saskatchewan Roughriders in the Canadian Football League. He leads by example on and off the field. Here is Barrin's inspiring story. This brings back memories of the late great Reggie White - nicknamed the Minister of Defense during his Hall of Fame NFL career. Do you know Voice Pro No-No's? The acronym, TWIB, involves baseball of course. The TV show started in 1977 featuring Mel Allen every week. He passed away in 1996 and Buzz Brainard is the current host. #Kelowna Falcons are finishing the baseball season strong! 10-4 win against Bellingham tonight! #McDonald's Ronald McDonald sang Cdn anthem! I posted a little earlier than usual today because I can remind you now to get a Blizzard and help the kids! Thursday is Miracle Treat Day at DQ®! Pierre McGuire won't be working as much in Canada any more. He's moving to Canaan, Connecticut from Montreal and concentrating on his career with NBC and Versus. I wonder if those ducks in my picture yesterday could sit still like that in a church pew? ◄◄◄There is a church renovation going on in our neighbourhood. ◄ Talk about a room with a view! ◄ If you build it, they will come. The line in the baseball movie "Field Of Dreams" in 1989 was "If you build it, he will come." A work in progress is a good way to describe God's church and its people. We are not perfect - but we are forgiven. Remember the childhood rhyme: “Here’s the church. Here’s the steeple. Look inside and see all the people.” I googled it and found it on the "Getting Down With Jesus" blog. "Church is people," says the author, Jennifer. "And Hope is the cord that ties the people. Hope is the thread that weaves through souls to make one Body. I’m part of this now — this one Body." Her latest post is: Stand Still And See. We were also encouraged today at our church by Pastor Phil to be still this summer and listen for God's voice and His teaching. Finally, congratulations today to Scott Stallings for winning his first PGA event! He quoted Philippians 3: 13-14 after his playoff victory against Bill Haas (close but no cigar in spelling to my last name) and Bob Estes. a) The Duck$ stop here. b) "(Sittin' On) The Duck of the Bay." My ducks are all in a row"
e) Don't worry. I've got your back. (A dog's eye view is here). I just finished up some lines for a mobile game development studio and a poker game they have coming out. Looking at the lines, it struck me that they could have been used by a hockey referee over the course of a game too. Have a listen here. For Corporate relations, please press 3; For Human Relations, please press 4. It was number two on TIME magazine's list of the Top 10 Unfortunate Political One-Liners. Damn Dynamite Yankees! Robinson Cano hit 32 home runs tonight to win the Home Run Derby at the All-Star game in Phoenix. His dad was pitching them to him. ◄◄◄My sons and I saw Cano hit a home run in this 2-0 win in Seattle. What a pitching matchup! Randy Johnson vs Felix Hernandez. ◄◄◄The next day (and new month) saw Seattle win 5-1. In those two games, leadoff hitters Derek Jeter and Ichiro Suzuki didn't give us our money's worth. Jeter was 0-6 and Ichiro was 0-8. This is my 44th post of the year...so Happy July 4th or 44th!? Number 44, BC's Jason Bay, helped the New York Mets beat the Yankees, 3-2, in extra innings today - spoiling the 44th birthday of Yankees GM, Brian Cashman. One year ago on July 4th, I paid tribute to the Yankees on my blog: Happy July 4th! Classic Steinbrenner on "Seinfeld." The most famous number 44 in Yankees' history? Of course, Reggie Jackson. His number was retired in 1993. This list includes all the players who have had their numbers retired by the Yankees. Seven time NHL All-Star Paul Kariya announced his retirement the other day. I paid tribute to Paul on my blog in early 2008: Fine 4444orm! My Dad is a hero! We just finished watching Adam Sandler's "Big Daddy"as a family on Father's Day. One of two movies I received. The other was "Brooklyn's Finest." Thank you for teaching me SO much Dad! Sorry, but brown beat blue in game 7 in Vancouver on Wednesday. Boston wins the Stanley Cup! Congratulations! Don't worry...I do like country music. Maybe that will be my next songwriting attempt? Thanks to everyone for your support of the CanuckStruck video anthem by RH/DC! Over 1, 500 views in the last two weeks! Stats show 79% of those are male while 70% of viewers are between the ages of 45-54. Winners! Justin Hass ☑ Dallas Mavericks ☑ Canucks? "Déjà Vu"...Game five went to Vancouver Friday night, 1-0. Thank you for an assist Raffi Torres! The goal early in the third was scored by Maxim Lapierre. The Canucks can clinch the Stanley Cup Monday night on my son's 18th birthday. Justin graduated this weekend from high school! Congratulations tonight to the Dallas Mavericks who won their first ever NBA title, beating Miami 105-95, and taking the series four games to two. The blue team prevailed tonight and I'm hoping for the same result tomorrow in Boston! Yes, British Columbia loves Boston! NOT the Bruins but Boston Bar - a small community of a couple hundred people. It's close to Hell...Hell's Gate actually...lots of spawning salmon must pass through the part of the Fraser River there every year. Beautiful blue skies Saturday for the grad tradition of the walk on the waterfront promenade. Shooting for their first ever Stanley Cup against Boston! Game one went to Vancouver last night, 1-0. Thank you Raffi Torres! Shaquille O'Neal retired today after a brilliant 19-year career! Happy Birthday to our amazing daughter, Ashley! The goofy guy below celebrated his 30th birthday in the spring of 1994 - the year the Canucks went all the way to the Stanley Cup finals, only to be disappointed by a game seven loss to the New York Rangers. That is a hockey shirt from the Las Vegas Thunder. The Vancouver Canucks will be in their third Stanley Cup final beginning at home Wednesday, June 1. The Boston Bruins are the only team who can stop us from winning the Cup for the first time ever! I have been involved this week in the imminent launch of http://www.canuckstruck.com/, one of the most creative projects I have ever been a part of. More details will appear on this blog soon.